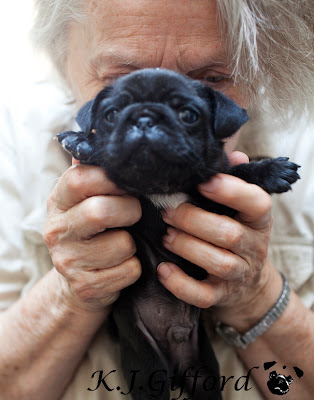 "Mama Joan" plays Peek-A-Boo with one of her five new puppies. They are growing fast. 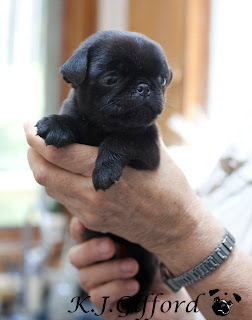 Visiting Pugdom, Joan's house, is always a treat and an unique experience. I love it there. It is as if time disappears and you are caught up in a different world where dogs rule. 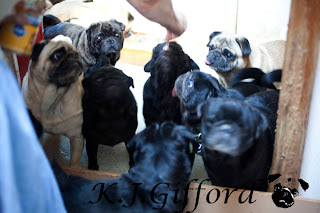 Joan has anywhere between 14 and 18 pugs at any given time. Tonight, one of the puppies, Batman, was not feeling well. He is a bit congested and not nursing, so Joan and I fed him goat's milk from an eyedropper and Joan is keeping watch over him tonight. Waffles did not seem phased by being back at Pugdom. She bounded up the stairs to greet her sister, mother and grandmother in the bedroom and checked on all the puppies, but when it came time to go home, she just as eagerly trotted down the stairs to jump in my car. "You will always have two homes," I told her.